The Asterisk Manager Interface (AMI) is a system monitoring and management interface provided by Asterisk. It allows live monitoring of events that occur in the system, as well enabling you to request that Asterisk performs some action. 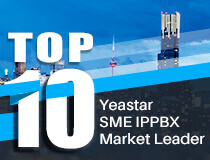 Yeastar S-Series VoIP PBX supports AMI and the default port is 5038 (TCP). Before issuing commands to Asterisk, you must establish a manager session. Packets may be transmitted in either direction at any time after authentication. The first line of a packet will have a key of "Action" when sent from the client to Asterisk, but "Event" or "Response" when sent from Asterisk to the client. The order of lines within a packet is insignificant, so you may use your favorite programming language's native unordered dictionary type to efficiently store a single packet. CR/LF is used to delimit each line and a blank line (two CR/LF in a row) indicates the end of the command which Asterisk is now expected to process. More information about Asterisk Manager Interface. Before logging in S-Series VoIP PBX via AMI, You need to enable AMI feature on S-Series VoIP PBX Web interface first. 1. Go to “Settings->Security->Service” page, enable AMI. 2. Specify the AMI username and password. 3. Add permitted IP range to access AMI. 4. Click “Save” and “Apply”. In order to access the Asterisk Manager functionality, a user needs to establish a session by opening a TCP/IP connection to the listening port (usually 5038) of the Asterisk instance and logging into the manager using the 'Login' action. In this example, S-Series VoIP PBX‘s IP address is 192.168.9.174. We use putty software to log in S-Series VoIP PBX AMI. 2. Enter S-Series VoIP PBX’s IP address, AMI port and choose Raw input the IP address, port, and choose Connection Type to ‘Raw’. 3. Click “Open”, you will see the figure shows as below. 4. Enter the following commands. The username and secret are AMI username and password that we set on S-Series IPPBX web. 5. Press “Enter” key twice to connect to S-Series IPPBX. The sequence in the response event doesn't send a carriage return - line feed (\r\n), it only sends a line-feed (\n), if you write a handler who wait for a carriage return - line feed, the result sequence is ignored and send the respond that you mention. You can originate a new call through the terminal side using command ‘originate’, and there are some differences between SIP extension and analog extension. Below are the commands to originate a call from extension 1000 to 1001. Below is another example for you to dial from extension 1002(analog phone) to number 1003. A NewChannel is triggered when a new channel is created, an Event:Cdr log will be generated if the call ends. The Uniqueid is the same in a new channel. When the S-Series IPPBX responds with an “Event:DialBegin”, we can find the destination number from Header “DestChannel”, and find the incoming call’s caller ID from the Header “CallerIDNum”. The destination number is 474. The destination number is 306. The destination number is analog port 65. It means dialing out via SIP register trunk “test1”. It means dialing out via IAX trunk “test2”. It means dialing out via SIP peer trunk “sps-test3”. The following example shows a call comes from 1000 to a PJSIP extension 1001. Use command ‘redirect’ to transfer calls. The following example shows how to transfer a call. 1. Extension 1000 calls to extension 1001. 2. Extension 1001 does not answer the call, the call will be transferred to extension 1002. ActionID can be any value. Before executing the command, we recommend to get the whole commands by the command ‘core show help’ in asterisk CLI through SSH. The contest left is only partly listed. This command will transfer extension 305’s call to 306. Message: Thanks for all the fish. It shows 303 dials 305 first, then 305 parks the call to 690. Used to describe the call detailed record, including time, callerID number, callee number, call duration etc. exist a command for add and for show the blacklist?